MOSCOW, September 14. /TASS/. 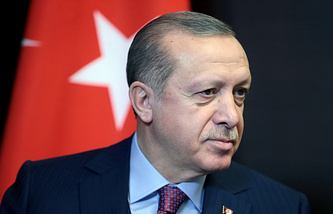 Kremlin Spokesman Dmitry Peskov has admitted that the next meeting between Russian President Vladimir Putin and Turkish President Recep Tayyip Erdogan will take place in Sochi on September 17. "Yes, this meeting is possible and it is being prepared," the Kremlin spokesman told journalists. He replied in the affirmative to questions about the venue and date of the negotiations - Sochi, September 17. Turkish Minister of Foreign Affairs Mevlut Cavusoglu stated earlier on Friday that Erdogan plans to discuss developments in Syria with the Russian president on Monday, September 17. "We held negotiations [on Syria] with various countries recently. We’re ready to fight against terrorists, and we also want to achieve a political settlement of the Syrian crisis and are ready for cooperation in these issues. However, we are against hurting women, children and civilians at the pretext of the war on terror. We will continue our contacts soon: President Erdogan will discuss the situation in Syria with President Putin on Monday," the TV channel NTV quoted Cavusoglu as saying. Still, a meeting of presidential aides from Russia, Germany, Turkey and France devoted to Syria will take place in Istanbul on Friday. Russian Presidential Aide Yuri Ushakov earlier said about the plans to hold these negotiations. He and "a number of experts" plan to take part in the meeting on Syria in Istanbul on September 14. He specified that the presidential aides may discuss the agenda of the possible four-party summit on Syria which may also be held in Istanbul. A meeting between the Russian, Iranian and Turkish leaders devoted to the Syrian issue was held last Friday, September 7, in Tehran. Moscow, Tehran and Ankara agreed to continue to apply efforts to protect civilians and improve the humanitarian situation in this Arab country. They also considered it necessary to simplify the process for the development of the Syrian Constitution in order to adopt it as soon as possible. The summit participants have agreed that the next high-level trilateral meeting on the Syrian settlement will be held in Russia. In 2017, the northern de-escalation zone was created in Idlib, where militants and their families who refused to reconcile and lay down arms could move to. According to UN Special Envoy for Syria Staffan de Mistura, there are about 10,000 militants from the terror groups Jabhat al-Nusra and Al-Qaeda in this region.